We recently decided to give up eating meat at home. And milk, eggs and cheese, too. “What, are you going to hire a personal chef now?” replied a friend, in a tone of near-disgust when we mentioned this to them. “It’s not that hard to cook healthy vegan meals”, was our reply. And then we laid out some of the reasons we are trying this, environmental sustainability chiefly among our motivations. More retorts from the friend about our misguided thinking. We're doing this at home, just for us, and we’re not asking others to do it too. If you come over for a barbecue, you’re still likely to get meat as we have a freezer with a backlog of the stuff. Look, the reasons really are our own, and we’re not trying to convert you to some new meat-free religion…unless that’s what you want… JOIN US! Mwhahahahaaaaaa! 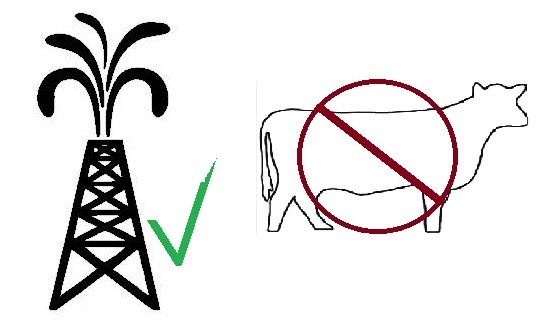 We first turned our minds to the idea when we saw some facts about environmental impact of eating meat. Some of it we already knew, but we looked deeper. It’s remarkable. Fact is, animal agriculture is responsible for 18 per cent of greenhouse gas emissions, more than the combined exhaust from all transportation sources put together, globally (13 per cent) FYI, that’s a stat from the United Nations, not just your hemp clothes-wearing uncle with the acre of weed growing in his backyard. 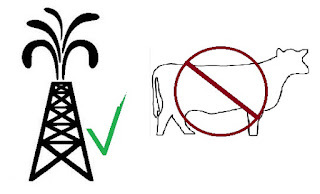 Funnily enough, the reports on animal agriculture practically make energy production look like the new environmentalism (OK not quite true), from land destruction to water usage to off-gassing, etc. the list goes on. but the fact that we focus so much hate on the energy industry and so little on animal agriculture is strange. Enough of the stats . Suffice it to say, these are several of our motivations for trying this veganism thing. So far, our experiment at home has been fun. It’s really switched up our cooking routine, which frankly was growing repetitive and stale. It’s made MY guts feel better for sure. I won’t go into the gory details, but let’s just say that dairy never agreed with me anyway. The kids have entered into this thing a little more trepidatiously, and fair enough. This is being forced upon them a little bit. But it's pretty funny to watch. 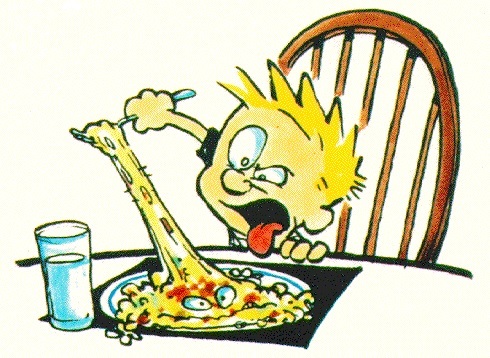 There are regular stink-eye sessions at the dinner table a la Calvin and Hobbes. Little does our son realize it, but his gravy was recently made from his number one food nemesis: The hated mushroom. And he loved it. Sucker. On the whole, things are going well. We’ll continue on with a pilot phase for a while, but so far, all signs point to being satisfied, full, healthy, etc. No, I am not wasting away from calcium deficiency. Yes, I get enough iron. Protein? If anything, I need less. But we really don’t want you to worry. If you’re coming over for a BBQ, we’ll still have something for the grill. If you’re at a restaurant with us, we aren’t going to be those obnoxious people picking apart the menu and complaining that there’s nothing for a vegan to eat. In fact, It’s likely I’ll still eat a proper burger, and the kids will have their pepperoni pizza and mac ‘n’ cheese. In the end, we will live our lives, you can live yours, and I hope we can still be friends that can look each other in the eye.